I am a newcomer so please excuse my ignorance. I have an unusual paperweight of unknown maker. The paperweight has a silver base. Whether or not the base was made at the same time or place as the paperweight, I do not know. I spent hours perusing the wonderful resources on this site but I apologize that I can't tell much about the hallmarks. The makers mark is SL and I am not sure about the three hallmarks under the maker's mark. I am listing this under the London Hallmark site because the London lion is the closest that I can imagine the first mark might be. I got permission from the photographer of the hallmarks to post his photo since I don't have a macro lens to photograph the hallmarks that are so very tiny. Thank you for any advice that you can give me. oops ... I should have stated leopard head rather than lion head! Sorry! To me the marks appear to be a set of silverplate marks or pseudo/fantasy marks. The SL mark, the name Steven Lundberg comes to mind. Steven Lundberg is known for his paperweights. Although never seen one made by him with a metal base. Indeed the white metal base could be a later addition. This is a Britannia standard Sheffield hallmark with the Yorkshire rose assay office mark in use since 1975. The third mark is the date letter, probably the script L for 1985. As it is not in your possession you will not be able to post a clearer picture for verification but if somebody can inspect the hallmark through a lens it may be possible to check my guess. The maker/sponsor is unknown to me. I will move your post to our Sheffield forum. Thanks Phil for opening my eyes. It was deceptively sold as Saint-Louis French paperweight. Wow! Thank you all for your prompt responses! I did know that St. Louis was not the maker of the paperweight when I purchased it because St. Louis was a glass foundry rather than a silversmith and is not known to make paperweights with these canes. I really appreciate your information. After spending hours pouring over the information on your wonderful site, I am so impressed with your knowledge! Has anyone seen other paperweights with similar silver bases? This is the only one that I have seen. Thanks again for your wonderful help! Fairly uncommon silver cased base paperweights. This one is Venice latticino Murano by Miani (started enamel and silver in 1965). 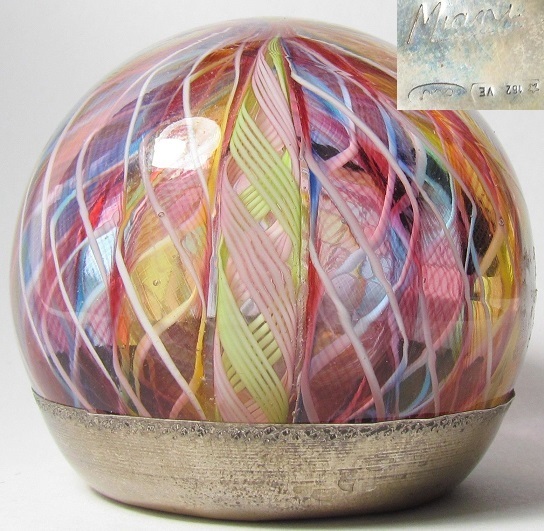 British paperweights are highly collectable, always signed and often with glass canes with maker`s initials within the glass.Have never seen one mounted in silver. 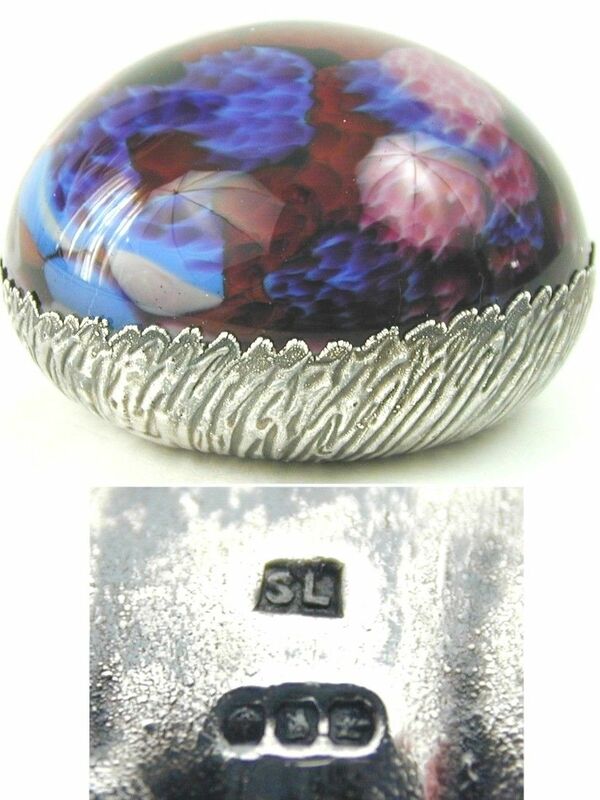 Thanks AG2012 for posting this photo of the Murano paperweight with silver base! Members of this message board have a wealth of information! 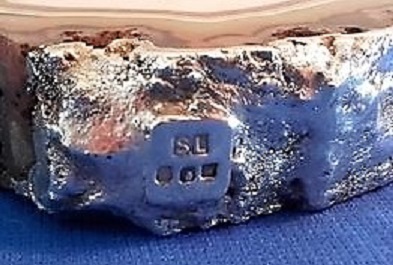 Many thanks to the remarkable help of Phil (silvermakermarks) who identified the mark on the paperweight base as a Sheffield Hallmark along with the Britannia and Letter L marks. I followed up by contacting the Sheffield Assay Office for identification of the SL maker's mark. "I have managed to trace the Sponsors Mark SL – This is the mark for Scotcade Limited, who were based in Shropshire, they registered with the Sheffield Assay Office in 1979 and used this mark until 1990. The piece is marked with the Tudor Rose for Sheffield , the Figure of Britannia 958 parts of silver / 1000 p[arts and the date letter L = 1985." Thank you very much for taking the time to update the topic and passing this information on to us. It's very much appreciated. Thanks so much for posting the results of your research. The more information we can make public the more use all of our resources become. 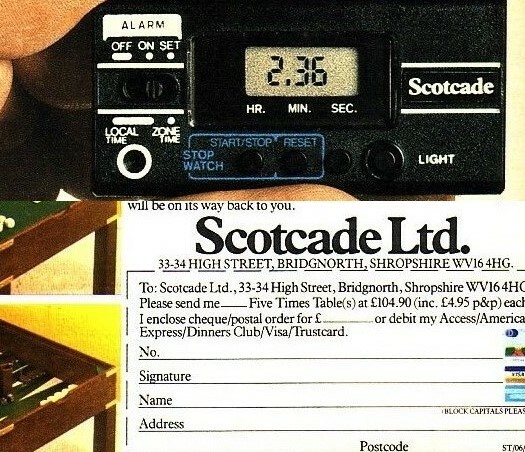 Scotcade was a retailer chain (dissolved).Sold furniture, suitcases,clothing,kitchen appliances etc. This is Scotcade table and alarm clock ad.Pay attention to company name on the clock and the address; they certainly did not make the variety of articles they sold, and they were not silversmiths either. In a word, SL is sponsor`s mark, not maker`s mark. Good eye, AG2012! That is good infomration that the SL for Scotcade Ltd. was a sponsor's mark rather than a maker's mark. Scotcade ltd. even advertised a wheelbarrow that rolled on a ball rather than a wheel. I notice that Scotcade Ltd. also advertised some jewelry, such as watches, but I couldn't find any advertisement for paperweights with silver bases. Paperweights are vast collectors field.IMO it was a limited edition commissioned by a Scottish manufacturer of art glass (e.g. Caithness 'Moon crystal`). "I wonder if the mark is SILEDA LIMITED and not Scotcade Ltd. Or maybe they are affiliated closely enough. Sileda was incorporated in CEFN-Y-BEDD CLYWD which is in North East Wales. The Corning Museum of Glass has a catalog of their wares. The description is as follows: 'Glassware is handmade in studio glassworks in the British Isles, then ornamented with fine silver in Sileda's workshops in North Wales. Note, that the bud vases on leaflet 1 were made in West Virginia. Includes vases, perfumes, atomizers, powder boxes, silver deposit ware.'" A quick internet search did turn up exquisite examples of glassware ornamented in silver by Sileda. "Sileda Limited traded during the 1990s. Handmade glass pieces from studio glassworks throughout the British Isles were ornamented with silver in Sileda's workshops in North Wales.The base of the glass bottle is marked 'Selkirk Glass Scotland 1989'. The silver overlay is hallmarked as Britannia silver for Sheffield 1994, and marked with the maker's initials 'SL' for Sileda Limited." "The fine silver designs are then applied in our own workshops in North Wales, using an electro forming technique uniquely developed for the Sileda Collection. Each piece is tested by the Sheffield Assay Office and given a Britannia Hallmark - your guarantee of fine silver." I have followed this up with some internet searches of my own and am now convinced that this is the mark of Sileda Ltd. I have found an internet auction of a scent bottle with overlaid silver. Not only did the silver have the same SL mark but included in the auction was the original box with insert both displaying "Sileda Ltd". I will contact Emma at SAO and ask for confirmation as I note that there is another, slightly different, SL mark which may have been confused with this one. This is agate set in silver by Sileda. Although not sharp,the SL image shows two notches in a rectangle cartouche. Are there notches in your mark ? On the other hand, one cannot disregard the info by Sheffield assay office about Scotcade Limited. But setting various materials in silver seems to have been Sileda specialty.